Today, my most recent editorial for the Journal of Bodywork & Movement Therapies has been published. I’m intrigued to see what kind of response it gets as there is a lot of “noise” and disgruntlement in the professional circles of manual therapy at the moment, with increasing levels of research showing what osteopaths, chiropractors and physiotherapists do really doesn’t seem to work!!! Some professionals have responded to this by shouting “out with the old and in with the new” – often in the pursuit of neurology and pain science, which is very fascinating and valuable additions to the existing knowledge base… but there is no need to throw out the baby with the bath water. That knowledge base is just that, a foundation to build from. If research is showing it isn’t work well, the obvious thing to do is consider what is missing from the current equation of healthcare, rather than to over-turn the whole thing. Lederman’s repair-adaptation model, and a more comprehensive model proposed in the editorial. Here you see the model proposed by Lederman in his 2015 paper which focuses largely on pain and movement. The new more encompassing model proposed would apply to all pain and health conditions. 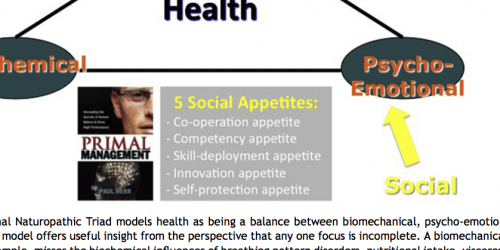 The naturopathic triad of health – with additional recognition of psycho-social factors from an evolutionary point of view. For many years, naturopaths have taught that biomechanics is only one part of the equation – after all, how can one expect an injured tissue to repair if the nutrition isn’t there to rebuild it? Or how can tensions be released if emotions still abound around a given incident, illness or condition? For too long, the therapeutic relationship has been a parent-child interaction. Now we need to move to an adult-adult relationship in our therapeutic dealings. In a branch of psychology, called transactional analysis, the concept that we can adopt a differing persona depending on who our interaction is with. For example, when we have a level of expertise in a topic we may take a “parental” role and our student may adopt a “child” role – even if we may be younger than the person we’re teaching – or, indeed, they may even be our biological parent! Below you can see part of a diagram which is highlighting how a process of mastery typically moves from one of right brain dominance in the primitive parts of development to a left brain dominance as knowledge starts to fall “in-formation” and then, ultimately to a left:right brain integration, where simplicity and integration once again prevails. 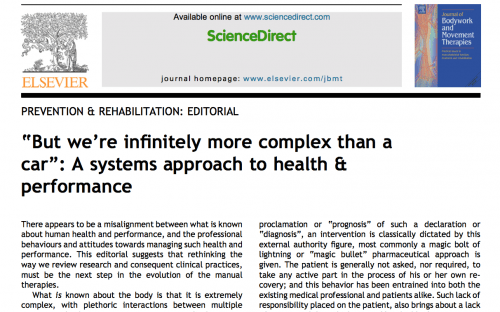 Part of the issue with specialisation prevalent in medicine is that it encourages (sometimes forces) practitioners to stay stuck under the depth of the complexity, which is a left-brain dominant mode. Finally, the question is really posed that just because a practice is the norm, should it necessarily be accepted? The quote below, from Krishnamurti, really captures the sentiment well. If you are intrigued to learn more, this topic was discussed in our webinar of the same title on March 23rd 2016. The full article comes free with the webinar.